The Museum has organised Art Colonies for more than thirty years. The aim of Colony is to invite the artists from different cultural environments but with similar pictorial expression to specific natural ambience and inspire them to do art and creatively interact with one another. ith this Nineteenth Art Colony, Museum of Naïve and Marginal Art uninterruptedly continues its four-decade long organisation of gatherings of the most significant representatives of the authentic phenomena on non-academic artistic scene. This event appears as a specific continuation of activities that oppose to academic canons, established even in the first forms of art colonies such as Vienna Artistic Brotherhood Luxabund at the beginning of the nineteenth century, Barbizon School (1830), or in this region, the First Yugoslav Art Colony Sićevo (1905). Naïve and Marginal Art as a field of artistic freedom which minimises the limitations of formal artistic principles, naturally appears to be a fruitful framework for organised gathering of non-conventional and authentic creative potentials. Biennially gathering naïve artists since 1984 and sculptors since 1992, the Museum develops Art Colony as a review, affirmation and stimulus to the most valuable realisations, firstly in domestic and later international naïve and marginal art. At the time of foundation of Colonies, Museum had already spent more than two decades on professional overall protection of self-taught art. Long-term experience defined the criteria for design and development of the event which would provide the best professional insight in current phenomena in naïve and marginal art. Since the very beginnings, the museum has insisted on processing and systematising documentary material, precious for its wide spectrum of possibilities for further research, as well as on publishing the results of work on Colony in such a way that would provide full presentation and information together with extensive affirmation. The ambiences which served to artists as powerful sources of spiritual potentials were selected for locations; they were either authentic treasures of cultural heritage or the nature itself as an inexhaustible origin of inspiration and initiator of creative introspection and expression. In the period from 1984-1992 the artists were doing art in the Museum environment, and then from 1994 Colonies were held at guest quarters of Monastery St. Prohor Pčinjski. In 2000 the Colony was held in Zobnatica, and the next two in Lisine. The gatherings of naïve and marginal artists have been organised on Zlatibor since 2006, within the tourist complex Kraljevi Konaci. The concept of this event changed with years, thus being adjusted to current courses in the domain of the most creative phenomena on non-academic artistic scene. In 1994 when the Sixth Colony of Naïve Artists was organised, the participation of foreign authors brought an international character. Continuously following courses in the field of international naïve art, Museum included marginal artists in Colonies in 2002. After the First Triennial of Self-taught Visionaries in 2016, the Colony is held in the years between two triennial events. In the period from 1984-2017, Museum of Naïve and Marginal Art organised nineteen colonies, thus gathering 124 artists from 19 countries. The identity of Colony, aimed at overall protection of genuine values of artistic creations, was systematically built of well-conceptualised organisation, clear programmatic conception and continuity; it provided direct insight into general courses and development within naïve and marginal art as a whole or its segments, such as individual artistic oeuvres, problems, themes or groups connected by similar creative expression. The Colony is a direct stimulus and orientation for further work of already well-known authors. Special attention is dedicated to the authors who are at the beginning of search for own artistic expression, to whom the work in colonies as a form of interaction of diverse individual artistic affinities is especially precious. While selecting participants in the Colony, the needs for completion of professional documentation and collection are borne in mind, especially in cases of shortage of works of certain authors or lack of their diversity for proper presentation of their oeuvres. Through the work of colonies of naïve and marginal art during the last thirty-three years, continuous follow up of artistic creation of large number of generations and individual expressions of naïve and marginal artists was realised, while the Museum Collection and documentation centre were significantly enriched. 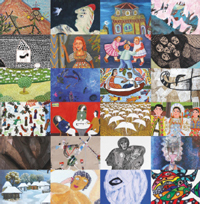 With the Nineteenth Art Colony of Nave and Marginal Art this year, Museum of Naive and Marginal Art procedes with four-decade long continuous organised gathering of the most significant representatives of authentic phenomena in non-academic artistic scene. The international selection of twenty-four artists from nine countries (Brazil, Bulgaria, Great Britain, Iran, Italy, Japan, Serbia, France and Spain) will do art in an inspiring ambience of Zlatibor from 6-14 July. During the Colony, in evening hours, art workshops, talks with artists, debates, interviews will be organised as a part of special programme, followed by artistic program, projections of documentaries published by MNMA etc. As a part of this year’s Colony, MNMA planned an one-day excursion to Monastery Mileševa. 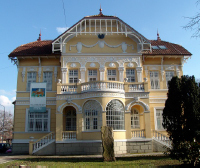 MNMA organises Art Colony on Zlatibor from 6 - 14 July 2015. Twenty-five artists from Serbia, Slovenia, Brazil, Bulgaria, Denmark, France, Italy, Germany, Japan, Indonesia, Russia, Iran, Cyprus, Haiti will participate in the Colony. 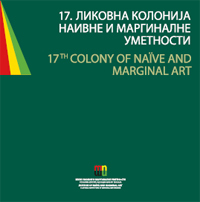 The exhibition of works done at the Eighteenth Colony of Naïve and Marginal Art on Zlatibor opened on 8 October 2015 at Art Pavilion "Cvijeta Zuzorić", Belgrade Besides the custodians of MNMA, the work of Colony is also followed by the team of colleagues from Lausanne, including Mario del Curto, a distinguished photographer and associate of Museum Collection de l Art Brut in Lausanne who will promote his film during the Colony. During Colony, the visits to Medieval Monastery Mileševa and Drvengrad on Mokra Gora are planned. This artistic event has been organized by MNMA and supported by Ministry of Culture and Information for more than three decades.